1. Patience – I’ve always been a very impatient person. Instantaneous gratification = GIMME GIMME GIMME! However, short of having a wave machine I’m pretty much at the mercy of mother nature and her timing. After hours upon hours of waiting for waves, I’ve learned to enjoy the present moment more and the big ride will get here when it gets here. 2. Endurance – Cardio training hasn’t always been big on my list of must do’s. Most of my life you wouldn’t catch me running unless some meathead was chasing me with a bat, or the liquor store was about to close. 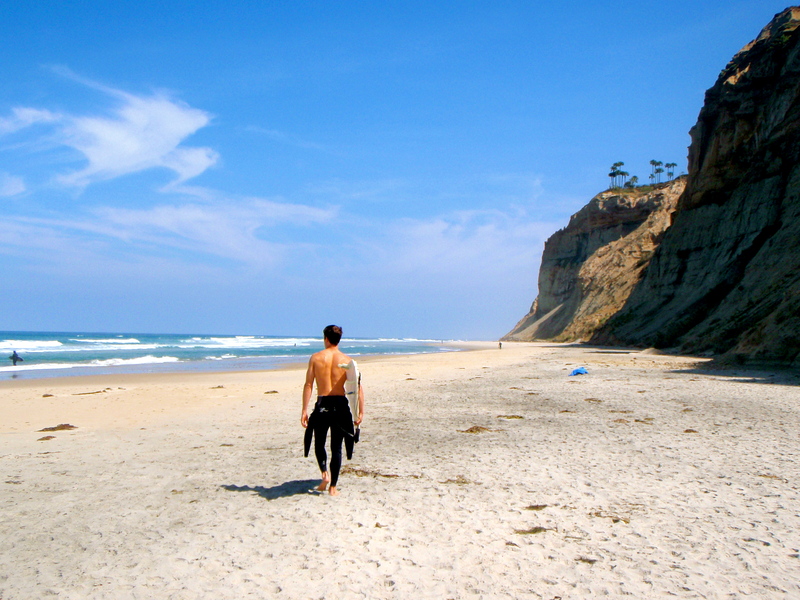 Surfing has forced me to work on cardio training and has helped to build more endurance. I still have a lot of work to do, but I’m thankful for all those times I thought I was going to drown gasping for a breath of air. After writing this, I actually feel like running down on the sand right now and getting in a bit of movement. 3. Balance – If you want to surf, you must be able to balance yourself. The more hours I spend on my board, the more it seems to translate into my day to day life. Much of my life I’ve partied like a rock star. At other times, I was damn near a celibate monk eating nothing but raw foods and bird seed. What I’ve found is that I genuinely enjoy partying, and I genuinely enjoy being healthy as well. I think I’ve found the perfect balance between the two, and it’s way more pleasurable to me than having rules on what I can or can’t do. 4. More Variety – When I first started surfing I’d go for any wave that seemed rideable. It was hard to decipher what was and wasn’t a good wave. Anything that could move and propel the board seemed good enough for me. After years and years of taking unnecessary spills I got a bit wiser. You must learn to pick and choose wisely. It’s not always about the waves you catch. Sometimes it’s about the waves you let go, and when you start to let go of waves, you suddenly realize there are so many better waves available. Same goes for life. Whether it’s a job, career, relationship, material possession, or a negative belief, you’ll often open a world of more opportunities if you can just let it go. 5. Dedication – If you want to really get good at surfing, you must be dedicated. It’s no cake walk. And neither is life. Every day we are faced with challenges and hurdles that test our abilities, dedication and perseverance. The more I commit to surfing, the more connected I feel to myself. The more I commit to myself, the more connected I feel to the earth. The more connected I feel to the earth, the more connected I feel to god. The more connected I feel to god, the more I just want to go back out and surf again! Mo,Your post teaches us to focus a lot more on what we need to do to get better at something, help others and just be be better towards our fellow human being. And, Surfing, even though I’ll never try it seems to kind of be like playing guitar and searching for the “Note”. Mark in Canada where it’s been unseasonably warmer. I love your attitude and the ability you have to write great content. I read the post that Chaz re-posted from your blog,”heart of an internet marketer.” That drove me to want to read more of what you have written on your blog. I must say the 5 life lessons, you learned from surfing are awesome. That article is a perfect illustration of your description “I learned how to write some copy and to translate my ideas and stories into sales letters…But you have to know how to tell them, and leverage them in ways that resonate with other people.” Your 5 life lessons from surfing article does exactly that. It resonates highly with me. It is told very clearly, makes great points, and as Lois says “it’s poison gas” it warms your insides and attacks the reader from the inside. I recently read George Lois’ new book “Damn Good Advice” and it says to keep reading and reviewing things important to you. And, so I have. I will be reading that surf article everyday. I am new to the SEO game, but I love it. Below, is a slideshow that I have been watching everyday that you may enjoy sharing with the following of less experienced SEO marketers. Awesome stuff, I am inspired, keep it fun.